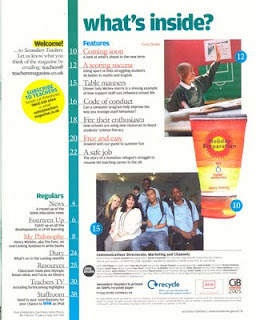 On this contents page there are two images of students at college. One of the images is quite large and at the bottom centre of the page, which catches the audiences eye. The other image is meduim sized and is at the top right corner of the page, this image has lots pf bright colours in used to get the audiences eye. By using these images when the audience opens the contents page they can see what the magazine is about, without reading lots of information. There is also a tube of some kind of product which is brightly coloured and stands out from the rest of the page. The images are labeled with numbers and therre is a row of numbers down the side of the page and next to the numbers are some sellines and explanations for the images. All these images link together through college and all form to be a main image. The colour scheme of this page is made up of different shades of blue, white yellow, orange and a bit of red. By making the background white it makes the colour and the images on the page stand out more which makes the contents page more interesting. There are a range of different shades of blue/green colours which adds brightness. Also by adding splashes of bright orange and yellow makes the page seem more fun and adds interest to the page as the background is white and needs colour to catch the audiences eye. 'Welcome' is highlighted bright yellow which automatically catches the audiences eye and makes them feel welcome and directed to personally. The bits of red in the page adds a bit of warmth and links in well with one of the images. The font on this page is all the same, block and bold which makes it clear to read. The size of the masthead is a lot bigger than any of the other writing on the page which stands out automatically and may suggesat that it is the most important thing on the page. Then the size of the headlines are smaller than the masthead but slightly bigger than the sellines which shows they're of next importance than the smaller headlines for individual sellines. Finally the sellines are the smallest font and aren't in bold which doesn't make them as easy to read, they are less out of focus because that way it doesn't over power the page with writing which may put the audience off.